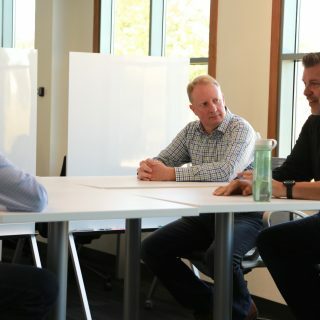 Whether you need a full-time, part-time or just-in-time workplace, LifeWorking Coworking has flexible memberships that allow you to leverage our facility as you need it. Click on Learn More to find the best membership option for you. Professional office space, available whenever you need it. Your house is under construction. You have an important conference call or meeting. You have a big proposal to finish. Regardless of the reason, you need a place to work. LifeWorking Coworking is here to help. 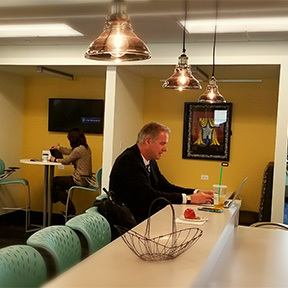 A $40 day pass allows you access to our fully functioning office space, including a desk, privacy, high-speed secure internet, phone booths for conference calls, free coffee all day and lounge space to network. A professional address for your business. You need a professional address where mail and packages may be received, and a comfortable place to work alone or to meet with others on occasion. The LifeWorker Lite package is a perfect solution for managers of family offices, foundations and home-based businesses that prefer a professional address. In addition to access to our member-only virtual community, events and services, this membership ($99/month) includes one day pass – or two half-day passes – per month, and one hour rental of our conference or collaboration rooms. 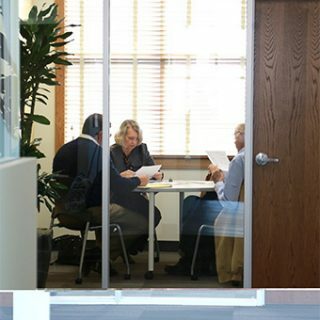 Additional conference room time may be booked at our membership rates. An Enterprise-grade business voice service can be added for an additional $49/month. You’ve set aside time to focus on a project, network with others, or collaborate with a team. Community members spend an average of one day per week with us getting their work done. This membership ($199/month) provides one day per week – or four day passes per month – with access to our drop-in desks, café’ and lounge spaces; two hours rental of our conference or collaboration rooms; and a complimentary monthly quota for printing and copying. Additional conference room time may be booked at our membership rates. You work in the city, but dread the daily commute. You travel frequently but need an office close to home. 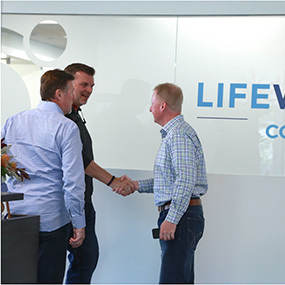 LifeWorking Coworking is your go-to location two days per week. This membership ($299/month) provides you with a professional address for mail and packages; access two days per week – or eight days per month – to our drop-in desks, café’ and lounge spaces; four hours complimentary rental of our conference or collaboration rooms; and a complimentary monthly quota for printing and copying. Additional conference room time may be booked at our membership rates. You build the business; we’ll manage the office. You’re busy starting a business, reaching a goal, or achieving a dream. LifeWorking Coworking provides you with everything you need without the hassle of setting up an office. This membership ($449/month) provides you with a professional address for mail and packages; access three days per week – or twelve days per month – to our drop-in desks, café’ and lounge spaces; six hours complimentary rental of our conference or collaboration rooms; an enterprise-grade voice service with unlimited domestic minutes; an upgrade to our enterprise-secure wifi; and a complimentary monthly quota for printing and copying. Additional conference room time may be booked at our membership rates. Members have 24×7 keycard access and also receive a personal locker and access to our first-come / first-serve central business district parking passes. Your full-time office without the hassles. 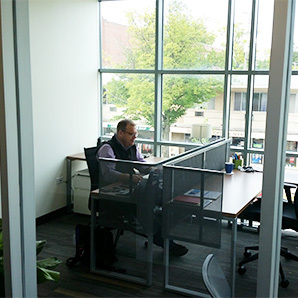 You prefer a full-time, private office but really appreciate a managed office space and a collaborative environment. Bring your computers and files; lock the door when you go home. LifeWorker Dedicated members have a furnished 1- or 2-person office; a professional address for mail and packages; six hours complimentary rental of our conference or collaboration rooms; an enterprise-grade voice service with unlimited domestic minutes; an upgrade to our enterprise-secure wifi; and a complimentary monthly quota for printing and copying. Additional conference room time may be booked at our membership rates. Members have 24×7 keycard access and a central business district parking pass. Ideal for small office or home office business owners or entrepreneurs. This $25 monthly add-on can be combined with any of the LifeWorking CoWorking membership tiers from Virtual Office to LifeWorker Dedicated. 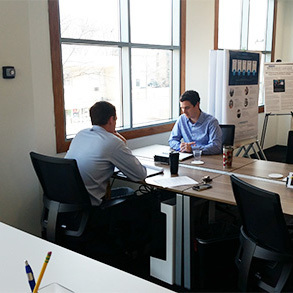 “Office Hours” on-site for a one-on-one consultation with Chamber staff at LifeWorking Coworking each Thursday 9 am to 12 pm. Stop by for a tour of LifeWorking and ask us about the ChamberWorking offer and any other questions you may have! Add your ChamberWorking membership to an existing membership at any time. To add on ChamberWorking to an existing membership please click HERE.